I regret that I met you only recently – the years I spent without you would have been that much more joyful with your presence. I am especially anguished to admit that I hated you at first. I thought that you were weak, useless, fat, and plagued with unfortunate skin issues, not unlike a 14-year-old videogame nerd. As far as I was concerned, you weren’t even worthy of joining me for lunch. Does my brutal honesty offend? So be it, I must tell my truth! And while our relationship may have started off on the wrong foot, my truth is this: I love you, avocado. I love you more than Michele Bachmann loves corndogs. I love you more than Sandra Lee loves Kwanzaa cake. I love you more than Sammi and Deena from the Jersey Shore love 6 Hour Power Energy Shots. That is to say, a lot. I’m sorry for any hurt that my years of rejection may have caused. I recognize that your tough exterior is only there to shield your soft and delicate interior from the inequality and misunderstandings plaguing this world. You offer me nourishment when I need it most and you never fail to impress when I take you to dinner parties. I would be proud to introduce you to my mother. Now I know it’s not easy bein’ green. But avocado, never change. They are really, really good for you. They get knocked for having a lot of fat, but it’s the magical “good” kind. That fat is precisely why avocados are so anti-inflammatory and why they help our bodies absorb nutrients. Fat is not the enemy, so eat your guacamole. Here is a nice tutorial on how to cut and peel an avocado from Simply Recipes. It’s easy once you get the hang of it. Avocados brown easy. 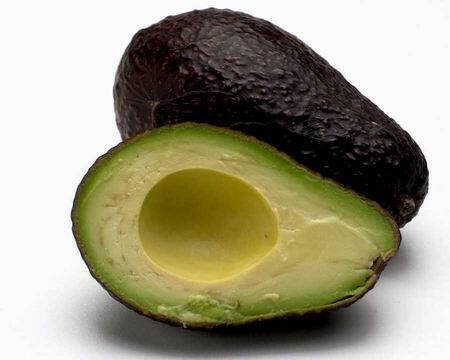 If you only want to use half an avocado, save the side with the pit and sprinkle the exposed surface with lemon juice. Wrap it up tight in cling wrap and put it in the fridge so you can use it the next day. A little browning won’t kill you, by the way. Tip from me to you: Nothing makes a grilled cheese better than adding thin slices of avocado. You should try and make this and I will too. I will add feta. Have any good avocado recipes? Let me know! In closing, avocados are delicious. Eat them. Avocado on grilled cheese. Interesting… will try. Cool picture. You won’t be disappointed, I assure you – such a good combo. Wish I could take credit for the photo, compliments of Google Image search. I make homemade burritos often, and for a time felt they were lacking something. Well, I gave Mr. Avocado a chance and sliced him up. Much better! And the recommendation of sprinkling it with lemon juice for preservation… that also sounds like a good idea for adding zing to a burrito. It’s true, avocado makes most things better. And I like the idea of adding a bit of citrus to a burrito! I bet lime juice would be even more delicious.